Our Watchnight Service is on Monday 24th, at 11.15 for 11.30 p.m. As in previous years, the Special Offering on Christmas Eve will be donated to Aberlour - Scotland's Children's Charity - and the Kirkcaldy and District Branch of the Samaritans. Your support will be very much appreciated. Dorothy Sillett has now completed two years making rag dolls! She says "Thank you to everyone who supported me during this time. Thank you for your help, your good wishes, your donations of material and crafty odds and ends and, most of all, for the business you gave me. Together we gave the Children’s Hospice Scotland £200 and 6 dolls to be sold in their shops (2011) and this year we gave SANDS £228 and Cot Deaths (Scotland) £150. I still have about 20 dolls to sell before I give them to Mary’s Meals in Inverkeithing and St Andrews. My sewing machine has retired! Happy Christmas and many many thanks". The Walkers next walk is on Sunday 6th January leaving from the Church at 12.45pm. This will be our Jubilee Walk as it will be our 60th outing together. As the weather may be unpredictable this will be a very short walk, 3 miles from Kinghorn to Burntisland. Modest celebrations will take place at Potter About. As always, all are welcome. Sunday 23rd December is our Christmas Service with contributions from the Sunday School. All are welcome. Refreshments will be available after the service in the Methven Hall. Please note that Poinsettia plants can be collected after the service. Sunday 9th December is our Gift Service to support the work of the Salvation Army in Kirkcaldy. Please bring a gift or toy (unwrapped) - no clothes please - for distribution to the needy in the district. The Walkers next walk is on Sunday 9th December leaving from the Church at 12.45pm. This is a short walk around Kirkcaldy ending at Bennochy church for festive refreshments and to take part in Christmas crafting. A news update has been received from Jenny Featherstone regarding a donation from Bennochy Church for the Play4All project. The November 2012 newsletter has been distributed to congregation members and is also available on the Newsletters page. The decoration of the Church for Christmas will take place on Thursday 29th November at 10 am. If you wish to help, please let Senga know or just come along. on the day. If you wish to have a poinsettia in the Church in memory of a loved one or friend, please put your name on the Poinsettia List in the vestibule of the Church by Sunday 9 December. These plants will decorate the Church on Sundays 16 and 23 December. After the service on 23 December you can take the plants home. The cost of a plant is £5. The Flower List for 2013 is now available in the vestibule. If you wish to provide flowers for the Sanctuary, please add your name to the Sunday(s) of your choice. 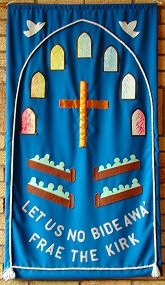 Kirkcaldy Presbytery have arranged a Banner Pilgrimage which will be passed between the Churches of our Presbytery and will be accompanied with neighbourly greetings, prayers and a message from the Presbytery Moderator. The Banner "Presbytery of Kirkcaldy in the Heart of the Kingdom of Fife" will visit our Church on Sunday 25th November where we will have the opportunity for our congregation to pass our greetings and prayers to other Churches in our presbytery. The event is due to run until Pentecost (19th May 2013) and will be commemorated with a Songs of Praise. Details to be advised. The Walkers next walk is on Sunday 25th November leaving from the Church at 12.45pm in shared cars heading for Lundin Links. This walk has a special theme so join us for a Murder Mystery trail around Lundin Links. Not a great deal of walking, but a whole lot of fun. Suitable for all and all are welcome. There will be a St. Andrew's Day Concert in the Church with the East Fife Ladies Choir and a choir from the North Primary School, in aid of Maggies Fife, on Friday 30th November at 7pm. Tickets are £10 per person or £15 for a family ticket. On Sunday 11th November, Remembrance Sunday, there will be a special offering for Poppyscotland to help them continue their support for our Armed Forces. Note the earlier start time of 10.50am. The Christmas Fayre will be held on Saturday 17th November. Please come along and support Bennochy Church. Enjoy Afternoon Tea and do some Christmas shopping. Tea tickets are now on sale now in the Hall priced £2. We plan to hold another Songs of Praise service on Sunday 25th November, If you wish a favourite hymn or song sung then please fill in one of the forms available from this morning – please be willing to say a few words as to why this song / hymn is special for you. We are required to place our order for the coming year by 22nd November to the Church of Scotland Offices. Please sign the list in the vestibule - yes or no - to continue your subscription. If we do not meet this deadline we will receive the same number of copies as this year and similar payment is required. Anyone interested in receiving a monthly copy as a new subscriber - please add your name to the list. The Rev. Dr. Inderjit Bhogal OBE, the leader of the Corrymeela Community, will be preaching at Bennochy Parish Church on the evening of Sunday 18th November at 7.00 pm prior to speaking to MSPs in the Holyrood Parliament the following day. Our annual Gift Day is on Saturday 20th October from 10am until 12 noon. Come along to the Methven Hall to make your donation and enjoy a chat over a cup of tea/coffee. If you can’t manage on Saturday you can bring your contribution in an envelope marked "Gift Day" any Sunday or give it to your elder. A date has been given for the shoe boxes to be returned to church and that date is Sunday, 18th November and the boxes are being uplifted by lorry from the church on Thursday, 22nd November. If you are unable to bring your box to church on the 18th, then please bring it when it is convenient to you but nearest to that date. Thank you for bringing joy and laughter to someone this Christmas. This eight week course is run as a partnership between Bennochy Parish Church and St Bryce Kirk. It takes place in St Bryce Kirk Centre, commencing on Tuesday 30th October. It begins with a meal (the course and meals are free! ), then Robin or Ken (or both) will lead our thinking on several topics. The course gives you the opportunity to ask questions and discuss the topics in small groups. Last year’s course was excellent, and we hope that more members from Bennochy will join in this year. Anyone interested, please speak to Bob Docherty about it. The Guild has a speaker from Mary’s Meals on Monday 8th October at 7.15 pm. Members of the congregation are welcome to attend. Please note that the Walkers next walk on Sunday 28th October has been cancelled. 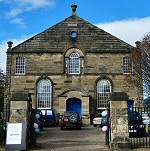 Linktown Church (newly updated site). Presbytery of Kirkcaldy (new site covering all churches in the presbytery). A high-tech, multimedia, mobile classroom, Bibleworld Mobile is visiting Kirkcaldy from Monday 29th October to Friday 9th November. Brought in by the Scottish Bible Society, local school children and other groups will be enjoying this highly acclaimed education resource that has all of the latest technology to delight, entertain and educate its visitors. You are invited again to fill a shoe box for people who have so little. Things we take for granted can often be luxuries for people living is desperate poverty in countries such as Albania, Bulgaria, Hungary, Moldova, Pakistan, Romania, Kosova, Serbia and Ukraine. By filling a shoe box with simple gifts, you can bring some joy and laughter to someone this Christmas. Covered shoe boxes are available in the vestibule with the instruction leaflet inside. A date for the filled shoe boxes will be given later but is likely to be early November. Please fill a box and bring a smile to someone this Christmas. The latest news from Jenny Featherstone, our missionary partner in Zambia, can be read by clicking here. The Women's Group are starting their new season of meetings on Tuesday 18th September at 7.30pm with a Silent Auction and Taster Evening. All new members will be very welcome. The Guild commence on the same date at 2pm with a talk on Pilgrimage by Rev. Marc Prowe. New members also welcome. The Prayer Group monthly meeting will be in the Prayer Room on Wednesday 19th September at 2pm for an hour and will be led by Mary Sherrard. Prayer request boxes are in the vestibule and prayer room. Our support for PLAY4ALL, one of the projects promoted by Jenny Featherstone in Kamatipa, Zambia, will be so much appreciated. A cheque for £361.90 has been sent to Church Offices, Edinburgh to be processed and thereafter sent direct to Jenny's Funding Account – specifically designated for the PLAY4ALL scheme. She will be in touch later with news of how the monies are to be spent. A sponsored walk on Sunday, 30th September around the Beveridge Park will start at 2 p.m. and finish when you are tired walking! Please meet at the main gate (at the lions) at about 1.50 p.m. Sponsor sheets available from Charlie Low and Jenny Walker - or just come along and join us for the walk and chat, and sponsor those who have sheets! Please support this good cause. Update: The walk raised £338.50 so thank you to all the walkers and sponsors. The Walkers next walk is on Sunday 16th September leaving from the Church at 12.45pm in shared cars heading for Aberdour. We'll stop for refreshments at the cafe on the shore and then return to Burntisland by the same route. Janis will lead this walk. All are welcome. This years Harvest Thanksgiving Service will be held on Sunday 9th September. Gifts of tinned and non perishable foods (packets, pasta etc) will be gratefully received which will go to the Salvation Army for distribution. There will also be a special offering during the service for "Play4All", a community project in Zambia in which our missionary partner Jenny Featherstone is involved. Thursday night Choir Practices commence on 6th September at 7.15pm. New members will be made most welcome. The Sunday School resumes on Sunday 26th August as part of the morning service. All new and returning children will be very welcome. This years Boys' Brigade enrolment for 2012/13 will be held on Thursday 23rd August for the following groups: Anchor Boys (5 - 8 yrs) and Junior Section (8 - 11 yrs) - 6.00 -7.30 pm, Company and Senior Section (11 - 19 yrs) – 7.30-9.30 pm. All boys welcome. Click here to see some of the activities the boys enjoy each year. Bennochy Church is once again participating in Doors Open Day on Sunday 9th September from 2pm to 5pm. On the day the Church and halls will be open and, amongst other things, visitors will be able to view the new stained glass windows and newly re-mounted war memorials. Refreshments also available. The aim of Doors Open Day is to promote our local heritage by enabling locals and visitors to explore through doors not normally open to the public, for free. A total of £10,566.82 was collected from 10 churches in Kirkcaldy who did door to door collecting. Coffees & lunches raised £2178.75 and Donations amounted to £260.00 making a total of £13,005.57 raised by Kirkcaldy for Christian Aid. Despite collectors being a bit down hearted with the response they received, eight churches were actually up on their door to door collection. So keep up the good work! Thank you to all who helped in any way - and by the way - there are plans ahead for a Christian Aid sponsored walk around the Beveridge Park near the end of September. More information nearer the time. The Walkers next walk is on Sunday 19th August leaving from the Church at 12.45pm in shared cars heading for Crook of Devon. This one will be a bit more testing than usual, walking approx. 5 miles from Crook of Devon to Rumbling Bridge and return through the gorge. Stout waterproof footwear is advised. Refreshments at The Inn at Crook of Devon. All are welcome. Come along to our Strawberry Fayre on Saturday 18th August from 2 to 4pm and sample our wonderful pavlovas, sponges, chocolate sponges, ice cream sundaes and strawberry scones. There will also be a stall with home baking and freshly made strawberry jam. If you haven't managed to our strawberry teas, please come and join us. All proceeds to Church funds. The recent Fundraising Bash held on Saturday 9th June for Cancer Research UK managed to raise the amazing amount of £1570.65 with Santander, who provide a matched donation policy for staff, doubling it to a huge cheque for £3141.30. Many thanks to all at Bennochy Parish Church for their help, support and donations for the event. The cheque was presented to the manageress of the Cancer Shop in Kirkcaldy at the service on the 17th and she is absolutely delighted with our help and support. Thank you again. On Sunday 24th June there will be a special offering for the Scottish Bible Society appeal for "Bibles for China's Millions". The Church in China is growing faster than we can possibly imagine. Thousands turn to Christ every single day, with 500,000 baptisms every year. Can you picture that? It's the equivalent of over 450 average-size Churches being created every month. These new believers have one thing in common. They all long for a Bible of their own. Yet, with the Church growing so fast, it is facing a virtual Bible famine. Millions of Chinese Christians do not have a Bible of their own. The Scottish Bible Society is asking for our generous and urgent help so that the Church can seize a wonderful opportunity. Every 80p we contribute will help someone in China receive a Bible and its life-changing message. Our financial support will be very much appreciated. Come and Join in the Fun - We are holding a fun and games day with a Bar-B-Q in the Church gardens on Saturday June 23rd from 3 - 5 p.m. It's a day for all ages, so come along and join in the fun. No cost and burgers a plenty. And guess what? We've asked the neighbours along !! - (if it rains, were in the hall - but it wont). The Walkers next walk is on Sunday 24th June leaving from the Church at 12.45pm in shared cars heading for a lovely 7 mile circular walk starting at Fluthers Car Park, Cupar, to Springfield where we will have a picnic in the church grounds. We'll have the use of the church hall. Please bring your own picnic and something to share. All are welcome. There will be a Fundraising Afternoon on Saturday 9th June at 3pm for Cancer Research UK in memory of Margaret Foster who sadly passed away in January this year. There will be refreshments, Cake & Candy, Carmen's Crafts, Tombola, Plants, second hand books/ DVD's, Raffles and lots more!! Tea Tickets are £2 and are available from Brenda Fraser, Sandra Wemyss, Ruby Burnett or Nan Williamson. Donations for the stalls will be most welcome and you can contact Brenda on 07772241814. Summer is here!! Strawberry Teas for 2012 commence on Friday 1 June from 2 till 4 p.m, and thereafter every fortnight throughout the summer. We hope to see you all there, in the gardens in glorious sunshine! If wet, the teas will be held in the Methven Hall. The first tea on 1st June will celebrate the Queen's Diamond Jubilee. If anyone would like to help throughout the summer, please see Grace or Senga. A big THANK YOU to all those who supported and helped in any way to make the Soup and Sweet Lunch such a success last Sunday. A total of £481.50 was made from ticket sales and donations. This was a great start to Christian Aid Week and the money will be used to support some of the poorest communities around the world to find their own solutions to poverty. Thank you again. Christian Aid Collectors - Hopefully the weather was not too unkind to you while delivering and collecting your Christian Aid envelopes throughout the parish and beyond. The total collected was £3,708 from door to door collections, the soup and sweet lunch, donations and tablet sales. The final total is subject to Gift Aid tax relief and will be published soon. If you can play an instrument of any description you are invited to a very informal get together on Monday June 11th & 18th at 7.00pm. The idea is to play music and have some fun. No long term commitment. Further information from Robin or George Drummond. The Walkers next walk is on Sunday 13th May leaving from the Church at 1.30pm in shared cars heading for Falkland Estate & Maspie Den. Refreshments at the Pillars of Hercules. All are welcome. Heart and Soul 2012 will be held on Sunday 20th May from 1pm to 6pm in Princes Street Gardens, Edinburgh. If anyone would like to attend this event run by the General Assembly Department of the Church of Scotland and would like to travel as a group please contact the minister or George Drummond. The Albany Church Deaf Choir will be joining us during the service on Sunday 13th May. This will be their second visit after being warmly welcomed last year. The Kirkcaldy branch of the RNLI is holding a concert in the Church on Saturday 26th May by The Fife Strathspey & Reel Society. Tickets, priced £5, are available from Senga Booth. We require more volunteer drivers for Sunday mornings and other events to help people who need transport. If you are willing to help, please see the minister. Please note all volunteer drivers require to be PVG (Protection of Vulnerable Groups) checked which can be arranged. Due to local elections using the Methven Hall, the Get-Together are meeting for High Tea at the Victoria Hotel on Thursday 3rd May at 4.30pm for 5pm. Anyone who would like to join them would be made most welcome. Contact Helen Lundie (205750), price £10 by Thursday 26th April. As part of Christian Aid week, there will be a Soup and Sweet Lunch after the morning service on Sunday 13th May in the Methven Hall. Tickets are available now priced £4. Dianne Waddell slept rough in the Royal Mile, Edinburgh on 23rd March to raise funds for Bethany Christian Trust. She reports "It was a cccauld nicht sleeping on the pavement, but so worthwhile. It costs about £30 for Bethany to take a homeless person off the streets, give them a hot meal, a warm safe bed for the night and then advice on how to move on from their situation. Due to the generosity of family and friends I’ll be handing over £691 (incl. gift aid) to Bethany Christian Trust. Sincere thanks to my many sponsors at Bennochy." Celebrate Easter at Bennochy Parish Church. A full week of events start on Tuesday 3rd April leading up to Easter Sunday on the 8th. On Easter Day, the Walkers are leaving from the Church at 7:30am in the minibus heading for Falkland Hill. This celebration of the Resurrection will return in time for bacon butties before the morning service. Cost £3 including a buttie. The Special Offering for Water Aid amounted to £218.90. Our support will help families access the safe water they so desperately need. Kirkcaldy presbytery are holding a special Celebrate and Discover Day at Kirkcaldy High School on Saturday 24th March from 10am to 5pm. All Churches in the presbytery will be participating with exhibitions, workshops, musical events and band concerts. Please take time to come along and join in with Celebrate and Discover. There is a lot happening throughout the day - something for everyone. In the main exhibition area you will find displays from all the congregations in the presbytery showing what they do well with an opportunity to chat to people there throughout the day. Take time to learn from each another, and to enjoy one another’s company. There is also a drop in area that will include displays from some national charities and organisations, as well as ideas from some of our congregations regarding pastoral care, youth work and fabric improvements. A quiet room will be available as well as areas for silent prayer. On the stage there will be performers from many of our churches throughout the day. In two workshops in the afternoon, Richard Michael will be bringing together singers and musicians to form a Presbytery wide Choir and Praise Band for the closing worship which begins at 4pm. Lots of ideas will be on offer and it is an opportunity for all of us to be encouraged and inspired for the future. Bring your friends and family, refreshments are available all day in the school dining area. The Walkers next walk is on Sunday 25th March leaving from the Church at 12.15pm in shared cars heading for Fluthers car park in Cupar. The walk then proceeds through Cuparmuir, Stratheden Hospital grounds, Springfield village and return via Elmwood golf club. A 7 mile circular, almost entirely flat. Refreshments at Springfield Tavern. All are welcome. In the afternoon of 18th March there will be a special service at 3pm to dedicate our new stained glass window commemorating the union. All are welcome. There will be Fairtrade Easter Eggs for sale from next Sunday, 18th, priced £4 – so be sure to bring your purses and wallets! The Special Offering at next Sunday's Communion Service (18th March) is for "Water Aid". Donations to "Water Aid" help the poorest people gain access to clean, safe water and sanitation. Every single day children have no choice but to give up things most of us take for granted. They have to give up their time, their education and their health, simply because they do not have access to clean water or sanitation. Our support to "Water Aid" will help families access the safe water they so desperately need. Thank you very much to everyone who gave a donation, bought a ticket and to all who attended the Souper Sunday lunch last Sunday. The total collected for the Church of Scotland HIV Aids project was £267. Dianne Waddell will be sleeping rough in the Royal Mile, Edinburgh on 23rd March to raise funds for Bethany Christian Trust, an amazing charity which cares for homeless people. If you would like to sponsor her, she will be very happy to accept your pledge. But WAIT....... Don't decide yet how much to donate to Bethany. WAIT...... Until you're lying in your superkingsize posturpedic with memory foam bed, on tempurpedic pillows under your goose feather and down filled duvet. GIVE! THANKS! .......with a grateful heart. Fairtrade Fortnight will be held 27th February - 11th March 2012. Fairtrade is about better prices, decent working conditions, local sustainability and fair terms of trade for farmers and workers in the developing world. Please support this by purchasing goods at our local shops with the Fairtrade logo on them. The sum of £1,150 was raised on 24 February at the SOS Day. I would like to thank everybody who supported in any way and helped me to raise this fantastic amount. The money has been handed over to the Kirkcaldy Branch of the RNLI. On behalf of the Kirkcaldy Committee, I would like to thank Bennochy Church for the wonderful support given to us every year, and helping us to raise money for the lifeboats and crews who do such a wonderful job around our coasts, often in very dangerous conditions. Senga Booth, Treasurer, Kirkcaldy Branch RNLI. This year's World Day of Prayer takes place on Friday 2nd March. This Service has been compiled by Christian Women of Malayasia under the theme "Let Justice Prevail". You are invited to attend one of the local churches on that day. The afternoon service is being held in Abbotshall church at 2pm. The evening services are in St. Pius church Templehall and Dysart Kirk both at 7pm. We are holding a special Memorial Service on Sunday 11th March at 3pm inviting all family and friends connected with Bennochy Church, our Parish or whose funeral has been conducted by our minister over the past year. All members of the congregation are welcome to attend. If you know of anyone else who would appreciate an invite please let Robin know. To raise funds for Kirkcaldy Presbytery's contribution to the Church of Scotland's HIV/AIDS project we will be holding a Soup Lunch on Sunday 4th March after the morning service. A letter of thanks and a Certificate of Achievement has been received from Blythswood Care. The letter states that 114,000 boxes were donated and dispatched to India, Pakistan, Kosova, Serbia, Albania, Hungary, Ukraine, Moldova and Romania, where they would bring the light and love of Christmas to people who are so desperately poor that even a toothbrush is a luxury item. Blythswood Care are humbled in receiving so many beautiful boxes, where the care and love of the donors shines out clearly, and volunteers helping in the sorting stations have found it a pleasure and delight. The Certificate of Achievement can be seen on the notice board. A special Tea Afternoon serving Sponges or Scones will be held in the Methven Hall from 2pm to 4pm on 24th February in support of the Royal National Lifeboat Institution SOS Day. There will also be a Cake and Candy stall. Tickets are on sale now from Senga or pay at the door. The Walkers next walk is on Sunday 26th February leaving from the Church at 12.45pm in shared cars heading for Townhill Loch, Dunfermline. The walk is flat but muddy in the wooded areas. On this occasion we are to meet up with the Walkers Group from St Andrew's Erskine Church, Dunfermline who will give us the benefit of some local knowledge and extend the very short walk around the loch to around 4 miles. Coffee and scone at local venue. A short course of Lent Studies will start on Tuesday 28th February. Booklets for the course are available from Robin. Students can attend any or all of the study meetings. The Guild are holding a concert in the Methven Hall on Monday 12th March at 7.15 pm featuring Maximum Revs. Tickets are available now priced £3 which includes refreshments. This issue can also be picked up in the vestibule in paper format. The waiting list to join the Brownies is now open again. Forms can be picked up from Brownies on Wednesday evenings or via Kirsty Robertson on (01592) 561493. Jenny Featherstone is now on the road again after major repairs to her pick-up truck. In December she visited the compound of Ipusukilo, where the INSAKA , the meeting place for the ladies' group, is in good shape and water-tight after the repairs to roofing and surrounding walls - all much appreciated. The planning for land and crops and tools is a bit slow without guidance, so Jenny is encouraging them to investigate prices, also to make a list of requirements. It looks as if they will rent 1 hectare of land and hire a tractor to plough it, so that they can plant soya and maize – now is the rainy season and suitable. The Walkers next walk is on Saturday 14th January leaving the church at 9.30am. We're heading for Auchtermuchty to do the Common Loop walk joining up with The Clink at approx 4.6 miles. It is on a gradient from the start, with some rough paths and muddy sections to contend with, but a smashing walk all the same. Coffee/bowl of soup at the Cycle Tavern at the finish. All are welcome.